What Should Be The Bulls Priority This Summer? 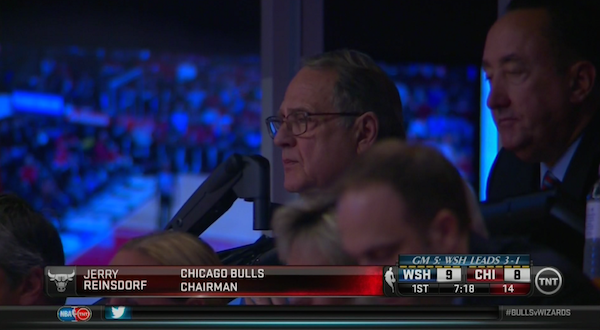 You’re Jerry Reinsdorf and Gar Forman, WHAT WOULD YOU DO? The Bulls season ended last night, and while I’ll have a post up on the season later today, right now I was interested in getting your thoughts. We all know everything Bulls fans want the team to do this winter, but what if they can only do one thing? What’s more important to you: getting Carmelo or amnestying Boozer? A healthy Derrick Rose, or Nikola Mirotic? So if the Bulls were allowed to do only one thing this summer — hey, maybe Adam Silver will go mad with power after banning Donald Sterling — what would you do? This entry was posted in Chicago Bulls and tagged Carlos Boozer, Derrick Rose, Gar Forman, Jerry Reinsdorf, Nikola Mirotic, Polls by Tom Fornelli. Bookmark the permalink. Rose doesn’t win you a championship alone. He needs help. So if anyone voted for anything other than brining melo here (boozer goes in that process anyways), they’re wrong. I could counter that by saying Carmelo without Derrick Rose won’t win you a championship either, though. What about thinking outside the box and getting rid of Gar\Pax…. What have they really done? In their defense, they tried to provide Thibs with scoring options to help prevent exactly what happened in this series. Thibs just refused to use them. I agree. I wouldn’t shed a tear if Paxson or Forman are replaced, but losing Rose for two years threw one helluva wrench in the gears. I’m not comfortable with getting Rose back being the key addition for an offseason, because after two big knee surgeries, we can no longer be a team that relies so heavily on just him. He isn’t going to change the way he plays and this team wasn’t good enough to win when he was the MVP (Noah wasn’t as good as he was back then, but we also had Deng then). We don’t know anything about Mirotic, but I’m sure even if he’s as good as advertised we don’t become a top half of the league offense especially since he’ll need time to adjust. I’m very excited about amnestying Boozer, but I imagine this is going to happen regardless and will have to if we get Carmelo. And I’m stoked about the Draft like I am every year, but the two guys I want most at the first pick are getting mocked higher and higher every day (James Young and Nik Stauskas). Does a Rodney Hood/PJ Hairston and Adreian Payne/Mitch McGary combo make us a lot better? I don’t know, but I don’t want to head into next season with that being the question and what we’re hoping for. Especially since if that’s all we do, we are relying on Rose staying healthy and not having any experienced contributors in the front court behind Gibson and Noah. I also was not too thrilled about Anthony eventually, but what else can we hope for? I think he’s the choice here by process of elimination. The “championship window” closes faster and faster with Rose and Noah injuries, so I think age shouldn’t be an issue when deciding on Melo. He can still be a productive scorer that opens up lanes and open shots for everyone else for most of whatever length contract we give him. I still want the ball in healthy Rose’s hands most, but if Melo is coming here for less money in the first place, I think he’d be OK with more of his shot attempts coming to him on a silver platter from Rose. As far as other options not listed, I don’t know. If Gibson definitely has to go in order to get Melo, I would be interested in a Lance Stephenson move for less money in order to keep Taj. I think a backcourt of him and Rose would be productive, and would serve a purpose of getting Butler and Gibson more open looks just to a lesser extent. Having three triple double threats in the line up would be pretty neat. Not sure how feasible this is though, but it may be my #1 choice. Not sure how much Minnesota is looking for in exchange for one more season of Love before they lose him, but the Bulls have a lot to give them. Seems like there’s this tacit agreement that Love is going to the Lakers after next season, but can Minnesota really be that stupid to just let it happen? LA and NY have no assets to give them really, and while the original assets we were offering like Jimmy Butler and the Charlotte pick look a lot worse after this season, we still have a lot more to offer. Gibson, Mirotic, the Sacramento pick, and even Butler still. I also would prefer this to Melo. You would think this makes sense for Love too. He is not a rim protector by any means, and he knows it. He should be looking to pair with someone like Noah. I just hope they do SOMETHING. Carmelo, Mirotic, something. Running it back with this same core and hoping Rose stays healthy isn’t going to work.